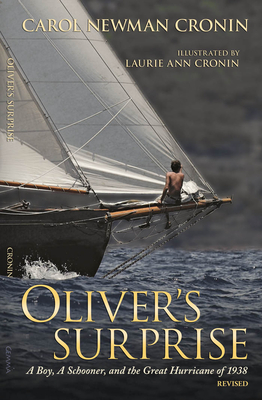 Longing to feel closer to his favorite grandfather, Oliver skips school on a sparkling September afternoon and hides out on a tired schooner. When he wakes up on the ways of his grandfather's boatyard and realizes he's been transported back to 1938, he must decide what to do before the dangerous hurricane he'd been studying in school hits. While the main character is a 12 year old boy, Oliver's story, and the story of a powerful weather event that still reverberates along the east coast, is more than appropriate for an adult audience. Written by a 2004 Olympian in sailing, this charming story includes 8 original illustrations, a glossary of nautical terms and a short history of the Great Hurricane of 1938 that devastated the eastern seaboard. The revised edition includes more photographs, maps, a History of Coastal Schooners and is accompanied by a new Teacher's Guide. Carol Newman Cronin crowned a lifetime of competitive achievement by winning two races for the USA at the 2004 Olympics in Athens. She has won numerous national and international sailing championships. Since retiring from Olympic sailing, Carol has focused on writing and graphic design. Carol Newman Cronin lives in Jamestown, RI. Laurie Ann Cronin is a long-time sailor and the sister-in-law of Carol Newman Cronin. She grew up on the Hudson River sailing a family owned nineteen-foot Rocket. Laurie graduated from Syracuse University with a degree in painting. She still sails the Finger Lakes of upstate New York with her husband and son, and occasionally visits the salty waters of Narragansett Bay.